When I was a kid I wanted to test the Johnson & Johnson “No More Tears” promise of baby shampoo. Well, I’m here to tell you, put any shampoo, directly and undiluted, into your eyeball, and you’re gonna cry. 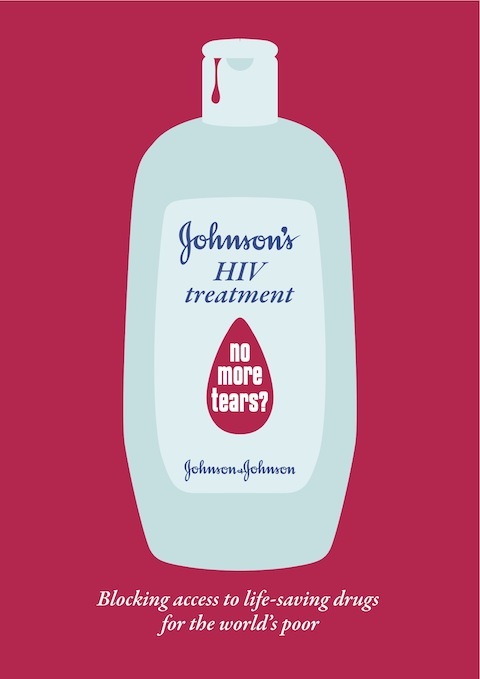 Ironically, the No More Tears catchphrase could sure come in handy right now for Johnson & Johnson. I don’t know who the Johnsons are, but they need to reorganize their priorities to get humanity a bit higher up on the list. Here’s the scoop: J&J holds the patent on a very important and effective drug used in the treatment of HIV/AIDS that, if released for generic production, could provide AIDS drugs to huge numbers of people around the world who cannot afford the name-brand drugs. Ten million people are still waiting for treatment, and a new initiative, in which other drug companies are involved, called the Medicines Patent Pool, would get the drugs into the usage stream around the world…but Johnson & Johnson has refused to cooperate. The Stop AIDS Campaign is mobilizing the power of the public, and has provided a petition here to present to J&J to implore them to put human life above bureaucracy. Can you lend your voice?